CUMBERLAND — The color purple is often associated with royalty. It’s also Western Maryland Food Bank Executive Director Diana Loar’s favorite color. And by the sound of co-workers and friends who attended a retirement celebration in her honor on Thursday, it was clear many think of Loar as royalty. “I think we’re losing a great lady,” said Chuck Koelker, the food bank’s board of directors president. Loar started the food bank 35 years ago as a small operation at Greise Brothers Market in Cumberland. For Loar, serving others is a family tradition. Her family accepted items from the Maryland Food Bank for the group home. Retrieving those items at a local church was Loar’s responsibility. 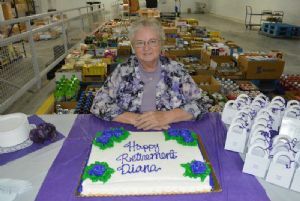 On Tuesday, when Loar officially retires, she will leave a 20,000-square foot warehouse on Bedford Street as her legacy, an operation that has served millions of pounds of food to community members and supporting nearly 100 local organizations. “I feel like it’s been a mission that I have accomplished,” she said. Amy Moyer, a food bank employee who handles food drives and fundraisers, will serve as interim director. Moyer, who was hired at the food bank in 1989, now has 29 years with the organization. She praised Loar for her accomplishments. It’s no surprise many think highly of Loar. She returned those thanks during her celebration. Her request — treat members of the community as they’ve treated her. “I just want to say, may you continue to be in the community what you have been to me,” Loar said.